With Hollywood studios investing money in big-budgeted tentpole features or in smaller scale artistic films (ones that are worthy of Oscar / award nominations), the subgenre of romantic comedies is left somewhere in the middle of those two extreme juggernaut film genres. Naturally, romantic comedies movies, which are both a subgenre to both the romance and comedy movie genres, have been around for quite some time; featuring a motion pictures with light-hearted, humorous, and dramatic stories that are usually centered around romantic nuances (i.e. such as “true love” and are able to tackle problematic obstacles (be it family, friends, or some unseen challenge). Additionally, like many films from other genres, romantic comedies can range from a wild array of styles; pulling from other movie genres in order to try to appeal to a “wider” audience. Some classic romantic comedy film endeavors include 1940’s The Philadelphia Story, 1953’s Roman Holiday, 1961’s Breakfast at Tiffany’s, 1987’s The Princess Bride, 1989’s When Harry Met Sally, 2007’s Waitress, and 2017’s Big Sick. Now, Warner Bros. Pictures and director Jon M. Chu present the latest romantic comedy from Hollywood in the movie Crazy Rich Asians; based off author Kevin Kwan’s 2013 novel of the same name. Is this Asian-themed rom-com worth a glance or is it just another “run-of-the-mill” and otherwise bland endeavor from Hollywood? As a Chinese-American, Rachel Chu (Constance Wu) is a economics professor at NYU, who’s been dating fellow professor Nick Young (Henry Golding) for over a year; the pair blissfully in love and enjoying their relationship with each other. 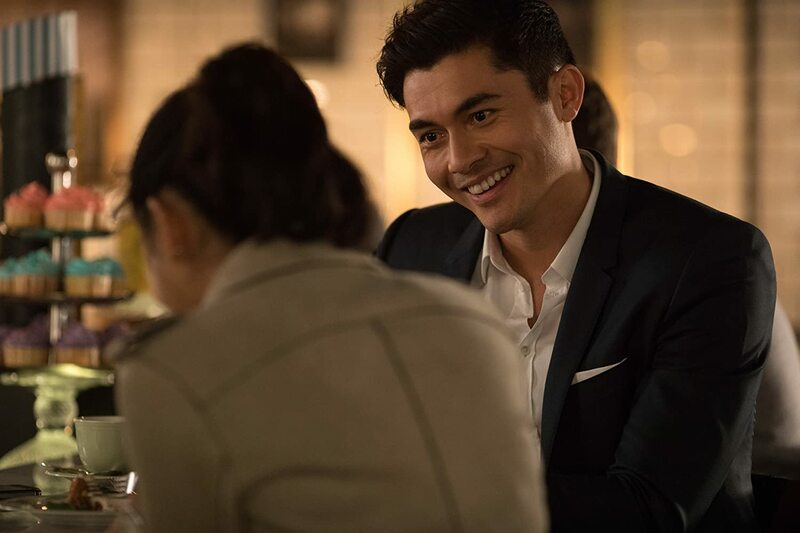 For their spring break, Nick invites Rachel to visit his home in Singapore, where he’s returning for his longtime best friend Colin’s (Chris Pang) wedding. Rachel elects to join on the trip, meaning it will be the first time she’s to meet his family, including his mother Eleanor (Michelle Yeoh) as well as getting a chance to visit her college best friend Peik Lin (Awkwafina), who also lives in Singapore as well. However, as they prepare for their flight from NYC to Singapore, Rachel learns the shocking truth that Nick, her long-term boyfriend, hasn’t been completely up front about his family…particular on how wealthy they are. 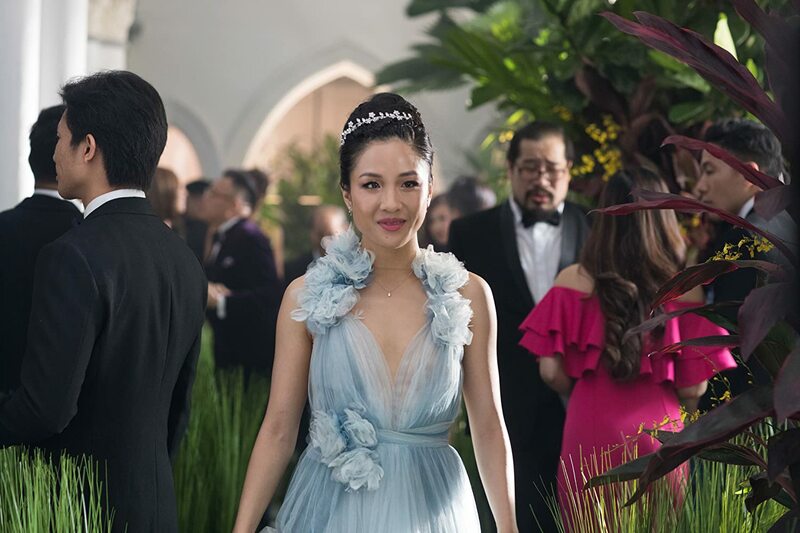 Once in Singapore, Rachel is quickly swept up in the world of Nick’s family, who are one of the premiere upper echelon families in the country, nervously navigating her way through Nick’s various family members and friends, including Colin’s fiancée Araminta (Sonoya Mizuno) and Nick’s ex-girlfriend Amanda Ling (Jing Lusi), during the pre-wedding festivities. Things only get worse when Nick introduces Rachel to Eleanor, who decidedly doesn’t think Rachel is good enough for her son. As the inherit gossip surrounding Rachel becomes the “talk of the city”, Rachel, along with the help of Peik Lin and several allies in Nick’s family, Nick’s cousin Astrid (Gemma Chan) and second cousin Oliver (Nico Santos), must decide if she wants to fight for Nick, or escape the extravagant socialite world of Singapore’s elite and lose her love in the process. I’ve stated before on my blog that some of my favorite movie genres are action, fantasy, and animated. I do like other films genres out there, but those particular ones are my personal favorite. That being said, I do like watching some of the “romantic comedy” movies. To me (for the most part), I like watching them as they are usually (as stated above) “light-hearted”, which means that I really don’t have to pull that much effort into watching the movie (i.e. not stressed out / nail-biter “edge of your seat” endeavor or a perplexing “highbrow” thinking feature that will having me scratch my head). They usually play the same two or three type of scenarios for the story’s plot (i.e. two lovers presented with a challenge and test their love throughout the feature), but these mostly work for a cinematic endeavor, with several films trying to add other nuances and aspects to try to make-up for the familiar terrain. To me, I do watch these movies usually when I really don’t want to get fully “invested” in a movie or when I’m doing something “around the house” (cleaning up or doing work) as background noise). Of course, there are plenty of romantic comedies out there, but the ones that I usually watch are like Forgetting Sarah Marshall, Sweet Home Alabama, This Means War, Bridget Jones’s Diary, and The Princess Bride just to name a few. In the end, while this subgenre might be “dismissed” by some of those movie snobs out there, the romantic comedy genre is still a favorable / popular one that should not be overlooked. Naturally, this brings me back around to talking about Crazy Rich Asians, the latest romantic comedy from Hollywood. Working at a bookstore, I always remember coming across the book titled “Crazy Rich Asians” by literary author Kevin Kwan. I would always see it the “fiction” section when I shelved book, but never really paid much attention; just amused by its title. Then, almost out of the blue, I remember seeing something about a film adaptation of Kwan’s book was gonna be released towards the end of the summer. Given the fact that I really didn’t know much about the book (or the plot in general), I sort of “brushed it off” and really didn’t pay much attention to it, focusing my interest in other late summer movies to see. Of course, when I saw the film’s trailer, my initial ideas were throwing out the window as the movie (given what was shown in the trailer) looked pretty good and definitely looked to be quite a “crowd pleaser” with many moviegoers out there. Of course, it looked vaguely familiar as well, but that’s the nature of the genre and did offer a bit of something different (i.e. being a primary Asian cast of actors and actresses). Unfortunately, I did get sick during its opening weekend, so I didn’t see it until two weeks after its theatrical release and then I got my schedule for work mixed up (I went to the movies to see Crazy Rich Asians, but then had to leave halfway through it to make it to work due to a sudden and unexpected schedule change). So, a few days later, I went back to see Crazy Rich Asians and saw it again (the whole thing). Now, I’m finally read to do my review for the film. What is worth the inherit hype? In a nutshell, it definitely was. While there are a few minor problems, Crazy Rich Asians is a solidly spectacular romantic comedy that filled with heart, humor, and dramatic beats as well within its Asian styles and influences. It may be familiar, but it’s definitely a fun take on an old classic tale. As a side-note, while I read wanted to read Kwan’s Crazy Rich Asians book (sometime during the summer before the film came out), I just didn’t have the time. Thus, my review is gonna be based on the film version of the story and not was added or changed from “page to screen”. Crazy Rich Asians is directed by Jon M. Chu, whose previous directorial works includes films like Step Up 2: The Streets, G.I. Joe: Retaliation, and Now You See Me 2. While he’s tackled several genres in his past projects (i.e. action blockbusters, musical teen drama, and caper thriller, etc. ), Chu makes his debut into the romantic comedy foray and (surprisingly) comes out on top, finding his iteration of Crazy Rich Asians to be highly enjoyable and probably one of his best (if his best) directorial film project to date. 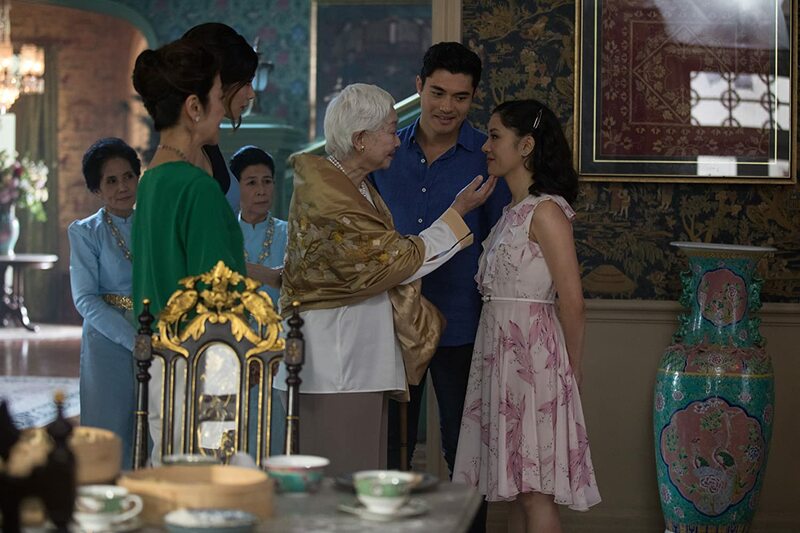 While the movie does travel down a formulaic path (more on the below), Chu makes Crazy Rich Asians find its own identity from the get-go, finding its own charm and swagger throughout the film’s proceedings. This, of course, makes the film that much more enjoyable, utilizing a sense of familiarity to gloss over the film, but doesn’t get weighed down by generic and overwrought by bland clichés. Basically, Chu doesn’t make the film feel like the tiresome / same old “song and dance” of a romantic comedy endeavor, but rather offers up a new take on an old classic type feel with Crazy Rich Asians. Perhaps the reason for this is the film’s narrative story that collectively carries a sense of Asian influence. The idea of presenting (almost celebrating) the ideas and cultures of Asians aesthetics and nuances is one of the hallmark positives that the movie carries and Chu seems to embraced that idea in the movie. To me, it’s great, especially coming from a major Hollywood studio, that would present a centralize culture theme for a narrative (of course, to Kwan’s novel as well for laying the groundwork). There’s also a sense of clashing of Asian cultures ideas (east vs. west), especially when examining Rachel (an American-Asian) and Eleanor (an Asian). The fundamental beliefs of culture and legacy versus the ideas of love and passion are presented within these two characters and is handled quite well, with Chu using that as the main catalyst of these two women in their pursuit of doing what is right for Nick’s future. Again, this adds a much more layer depth to the narrative, which is something quite unique for a romantic comedy (not just about laughs and / or romance). That’s not to say that Chu makes the film something incredibly weighed down with film melodrama as the director seems to find the near perfect balance of comedy, humor, and heart in the feature (something that a lot of romantic comedy endeavors of late have failed at trying to accomplishing). In the end, there’s a sense of sincere gesture that Chu makes when approaching this movie, which makes Crazy Rich Asians, while predictable, makes the feature highly enjoyable; letting the narrative flow in an entertaining manner and worthy of being an instant classic in the romantic comedy genre. On its technical merits and endeavors, Crazy Rich Asians is at the top of its game, boasting such a wide variety of cinematic elements that are beautifully and otherwise well-done to bring such a fantasy rom-com escapade of the rich and famous lifestyle. Given its Asian setting, the movie was shot in various locations in and around Southeast Asia region, including Kuala Lumpur, Penang, and (of course) Singapore. Naturally, the various landmark locations in Singapore, including CHIJMES (Convent of the Holy Infant Jesus Middle Education School), the Supertree Grove at Gardens by the Bay, Merlion Park, and Marina Bay Sand, are filmed on location and utilized for some of the main background set-pieces in the film; showcasing some of the best areas that Singapore has to offer. Thus, the whole location / scout team for the movie as well as the production designs by Nelson Coates and set decorations by Andrew Baseman should be commended for bringing the variant real-world locations to life for this cinematic tale. Plus, the cinematography by Vanja Cernjul is top-notch, great some standout / beautiful cinematic shots throughout the feature, especially one particular scene at Colin’s wedding. Additionally, the costume designs by Mary E. Voigt range from great to absolutely gorgeous in the film (and that’s a good thing). Other areas, including the film’s editing by Myron Kerstein, the casting by Terri Taylor (I know…I never mention the casting director, but the cast is fantastic in the movie. More on that below), and the art direction team (Leslie Ewe, David Ingram, and Gary Mackay) should also be applauded for their efforts in the movie. All of these filmmaking notions is given more credence under the fact that Crazy Rich Asians production budget was roughly only $30 million (roughly the same it took to make the first Twilight movie). Thus, Chu and the rest of his team utilized their production budget smartly and definitely shows that throughout the feature. Additionally, while the film’s musical score, which was composed by Brian Tyler is solid, with plenty of melodies and flourish throughout the film (ones befitting a rom-com endeavor), the movie’s soundtrack is pretty good, providing a mixture of some songs (some of which are sung with Asian vocals) like Cheryl K’s “Money (That’s What I Want)”, Kina Grannis’s “Can’t Help Falling in Love”, Sally Yeh’s “Material Girl (200 Du), and Katherine Ho’s “Yellow” as well as several songs from artist Jasmine Chen like “Waiting for Your Return”, “Give Me a Kiss”, and “Wa Yao Ni De Ai (I Want Your Love – I Want You to be My Baby”. Despite a lot of positives to say about this movie, Crazy Rich Asians does have one major drawback as well as a minor one that prevent the movie from truly being somewhat unique and incredible. Perhaps the most notable one that’s very easy to point out is the story that the movie wants to tell you. Again, I haven’t read Kwan’s novel (or any of its sequels), so I really can’t say draw parallel as to the book to the film. What I can say is the fact that the movie’s narrative is very much formulaic and easily predictable. Yes, both the story and plot of Crazy Rich Asians, no matter how much cultural references or racial diversity in its cast the drums up, the fact of that matter is it’s a plain and simple romantic / comedy love story. What do I mean? Well, I mean that the films travels down a very well-trodden path that almost tried-and-true love story movie has done for the last twenty years. A young loving couple, a stubborn and / or hardened parental, a wacky friend, mischievous family members, and an onset problem that occurs during the end of the second act, which finds a way to be wrapped up by the closing time of the feature. What does this all mean? Well, it means that Crazy Rich Asians does lack a sense of originality / creativity when it comes to plotting a narrative path for the film to navigate through, playing up many clichés and tropes that are commonplace in any romantic comedy. That’s not to say that the movie is bland or dull. In fact, the movie itself as well as the film’s script, which was adapted from Kwan’s book and penned by Peter Chiarelli and Adele Lin, actually produces some commonly used tropes (for the genre) for the better and are presented in a way that plays out more effectively (and entertainly) better than most romantic comedies have done of late. Additionally, the written dialogue for the feature is well-presented with enough sincerity to make rise above being cliched. Still, there is a sense of familiarity and predictably that makes the film’s narrative path easy to guess and the film’s overall outcome before it reaches that point. The other problem that the movie faces is the simply fact that there are too many characters in the movie. While movies and films have its fair share of supporting characters (both major and minor ones), Crazy Rich Asians gets really crowded with so many minor characters that many do get somewhat “shortchanged”. I assume that most of these characters (if not all) are in Kwan’s novel, but it seems that Chu (along with Chiarelli and Lin) had to streamline the narrative to fit a two-hour runtime. Thus, with the exception of the character Astrid, most of Nick’s cousins (and their spouses), and his friends are mostly undeveloped and could’ve been easily removed with little to no consequence to the main plot of the film. But more on that below. Lastly, there is the character of Nick’s father / Eleanor’s husband, who is mentioned in the movie a few times, but never makes an appearance. Again, I’ve never read Kwan’s novel, so I probably assume that he’ll eventually show up in the film’s sequel (whenever that materializes in the future), but it just seems like a character that’s…. left out. However, both of these problems were a bit minor to me and really didn’t hamper my overall enjoyment of the film. The cast in Crazy Rich Asians is also one of the true standouts of the feature, elevating what could’ve been a “status quo” endeavor of its varying characters. As to be expected, the whole cast is comprised of Asian actors and actresses that actually hold their own and do help strengthen the movie in both the film’s story plot and setting and the authenticity of the Asians flavored presentation of the feature. Leading the charge are the film’s three main leads, actress Constance Wu, actor Henry Golding, and actress Michelle Yeoh, playing the characters of Rachel Chu, Nick Young, and Eleanor Young respectfully. Wu, known for her roles in Sound of My Voice, Parallels, and Fresh Off the Boat, offers a very fun and relatable portrayal to her character of Rachel. Again, the character arc for Rachel isn’t that original and has been done before, but Wu makes the character her own, projecting a sense of naivety innocence (as she enters the Young family’s socialite world), but also shows the right amount of sweetness and standing up for what she believes. Thus, Wu’s Rachel Chu is solid for a character that could’ve played in a very bland tone. Likewise, Golding, known for his roles in A Simple Favor and Monsoon, provides a very likeable iteration of Nick Young, displaying the right amount of warmth and comfort whenever he’s on-screen. While the character of Rachel Chu is the more prominent one (of the pair), Golding’s Nick gets some material to play around with, projecting turmoil (inner conflict) of facing his family members with Rachel by his side and choosing to stand by her, regardless of what they think of her. Together, both Wu and Golding have great chemistry on-screen (and it clear shows), making the relationship between their fictional characters of Rachel and Nick extremely cute and something that us (the viewers) like to root for throughout the course of the feature. In a nutshell, the heart of the picture is the relationship between Rachel and Nick and both Wu and Golding sell that beautifully. Lastly, Yeoh, known for her roles in Crouching Tiger, Hidden Dragon, Kung Fu Panda 2, and Memoirs of a Geisha, rounds out the main trio of characters, providing enough gravitas and anchoring the film in the role of Eleanor Young. While she’s been in many motion pictures, Yeoh’s performance is stunning in the movie, and while the character of an overbearing a stern / coldhearted mother-in-law has become a bit of cliché, she definitely makes it her own in such a way that we (the viewers) somewhat sympathize with her a bit; wanting what’s best for her son and her family, despite her methods being mostly cruel. Still, Yeoh gives a stellar performance as Eleanor Young. Beyond the three main leads of the film, several members of the supporting cast (i.e. most secondary supporting ones) have some standout moments by either sub-plot design or by their screen presence. When considering the former, the character of Astrid, Nick’s cousin, standouts, who is played by actress Gemma Chan. Known for her roles in Transformers: The Last Knight, Humans, and Bedlam, Chan provides an excellent role to the character Astrid, a character that seems to be more its own side-story trajectory path away from majority of the narrative threads of Rachel, Nick, and Eleanor. Still, it’s a self-contain one and does have that have a wholesome well-roundness from beginning to end. Plus, Chan’s performance is great in the character. As a side-note, actor Pierre Png (Phua Chu Kang and C.L.I.F.) provides a suitable role in the film as Astrid’s husband Michael Teo, which involves her sub-plot in the film. When talking about the latter, the character of Goh Peik Lin, Rachel’s best friend from college, comes to mind and who is played by actress Awkwafina. Known for her roles in Tawk, Neighbors 2: Sorority Rising, and Ocean’s 8, Awkwafina is another standout performance in the movie as Peik Lin, utilizing her comedic timing for the role and being memorable in it. The same can be said about actor Nico Santos (Superstore and Go-Go Boy Interrupted), who plays the character of Oliver T’sien (Nick’s second cousin), who’s flamboyant attitude brings a humorous role (to an otherwise minor supporting one) to this rom com feature. The rest of the cast, including actor Ronny Chieng (Problems and Legally Brown) as Nick political cousin Eddie Cheng, actress Victoria Loke (Un vase a Chinatown) as Eddie’s wife Fiona Tung-Cheng, actor Remy Hii (Harrow and Marco Polo) as Nick’s filmmaker cousin Alistair Cheng, actress Fiona Xie (Serves You Right! and Fist of Dragon) as Alistair’s “wild” soap opera actress girlfriend Kitty Pong, actress Lisa Lu (The Joy Luck Club and The Last Emperor) as Nick’s grandmother (and matriarch of Young family) Shang Su Yi, actor Chris Pang (Marco Polo and Crouching Tiger, Hidden Dragon: Sword of Destiny) as Nick’s childhood best friend Colin Khoo, actress Sonoya Mizuno (La La Land and Ex Machina) as Colin’s fiancé Araminta Lee, actor Jimmy O. Yang (Patriots Day and Silicon Valley) as Nick and Colin’s former classmate Bernard Tai, actress Jing Lusi (Stan Lee’s Lucky Man and Survivor) as Nick’s ex-girlfriend Amanda Ling, actress Tan Kheng Hua (Marco Polo and Cages) as Rachel’s mother Kerry Chu, and actor Ken Jong (Community and The Hangover trilogy) and actress Koh Chieng Mun (Under One Roof and That’s the Way I Like It) as Peik Lin’s wealthy parents Goh Wye Mun and Neena Goh respectfully. As minor supporting characters, some of them are good (filling out the background of scenes and having one or two personal moments in the “spotlight”), while some just feel undeveloped and inconsequential to the narrative story (as a whole). Again, these are mostly Nick’s cousins and several of their spouses / friends, with very little sub-plot material or sum-parts to the story’s narrative. I’m not saying that their acting talents are bad (each give a solid performance in the movie), but the film itself is too crowded and doesn’t give a whole lot of time to them, which makes them pretty bland and vastly undeveloped and flat. The only thing “crazier” than love is family” is an expression that Rachel Chu quickly finds out when she travels with her boyfriend (Nick) to Singapore to meet his family for the first time in the film Crazy Rich Asians. Director Jon M. Chu’s latest film sees Kevin Kwan’s novel come to life on the big-screen, displaying the extravagant / fantastical lifestyle of the rich (and their escapades) as well as a perfect blend of humor, romance, and heart throughout. While the movie does tread into the familiarity territory (for the genre) and feel a bit crowded with its plethora of minor characters, the movie succeeds in immersing itself in the Asian roots (atmosphere, culture, and setting), it’s all Asian cast (who are all solid in the performances) from a major studio, and beautifully crafted film (from start to finish) that captures the essence of a classic / tried-and true romantic comedy. Personally, I loved this movie. Yes, it wasn’t exactly new or original, but it really didn’t need to be (and never expected it to be either), but it was presented in a way that was quite enjoyable and entertaining to trump a lot of recent romantic ventures. The story, while well-trodden, was good (better than most), the Asian-flavor / theme was nice, the cast was great, and the technical achievement were solid. Thus, my recommendation for the film is a “highly recommended one” as the movie is definitely worth a glance (or two or three) as is still certainly worth the praise and critical acclaim it has received since its release. It also should be noted that a sequel has already been greenlit by the studio minds at Warner Bros. and should be released in the foreseeable future. In the end, with so many other tentpoles that the big studios of Hollywood are churning out ever year (i.e. superhero blockbusters, horror flicks, and animated features), it’s nice to see that a film like Crazy Rich Asians stand out above its competition as exceptionally piece of romantic comedy entertainment. Definitely what a romantic comedy should be in crowded sea of Hollywood cinematic endeavors. Haha….it’s definitely worth checking out. The hype for the movie (and all its praise) its being receiving is spot on.